After all that time, suddenly, it was silent. After war had raged for more than four years, on the battlefields of Europe the quiet must have been eerie. There at the eleventh hour of the eleventh day of the eleventh month of 1918, the survivors must have breathed a sigh of relief. And it wasn’t, of course, not at all. Still, the toll of its carnage was staggering: more than nine million dead, more than 21 million wounded.2 So many lost that people hoped it would be the last. So many gone that it gave rise to what today, here in the United States, is called Veterans Day. 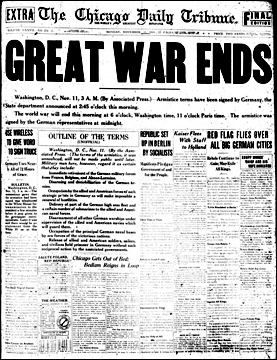 Image: Chicago Tribune, 11 November 1918, p.1; digital images, Newspapers.com (http://www.newspapers.com/ : accessed 10 Nov 2014). What? No Civil War veterans? Not wearing the uniform of my country, no. One in grey, yes.